One of the key design elements of the Diablo series, something that differentiates this series from most other RPGs, is the emphasis on solo play. Party play is supported and encouraged, but it’s never required. There are no maps or levels or bosses that can only be activated by a party, and while many monsters are a challenge to single players, with the right equipment and tactics anything can be taken down solo, by any class. Some late game features attempt to approximate Raid instances, the v1.11 Pandemonium Event, for instance, but even that area can still be soloed, and due to how its (un)balanced, some builds dominate it. On the whole though, the games so far released in the Diablo series have been designed and balanced for single player, with included multiplayer functionality added on and not especially well-balanced. Going by what the D3 Team Annihilus and Hellfire Torch, that’s unlikely to change in Diablo 3. From the developers’ point of view, the only difference between playing alone and playing with your friends is that the latter is more fun. They don’t want to create a scenario where the player would have to go and find friends in order to get through the content. What they do want is to create an environment that adjusts itself to the number of players in the group. The more players there are, the tougher the monsters will be. They are also looking into adding content like puzzles that require several players to solve, although that’s proving to be quite a challenge given the dynamic group size. That stated, multiplayer in Diablo 3 will not be a repeat of Diablo 2. The new Battle.net features will add more options, though the only specifics yet revealed are vague promises of easier connectivity. It seems likely that we’ll see enhanced friends lists and other more integrated ways to create or join games with friends, but when it comes to features with a direct effect on the gameplay, the D3 Team is keeping quiet. contact the author)? Raid Events are familiar to most players from games such as World of Warcraft. Most MMORPGs have dungeons that require large, mixed parties. Players can (usually) attempt them alone or in smaller groups, but they are recommended for, and balanced for, larger groups. These sorts of super quests in Diablo 3 could be end game only, or could be spread all through the game, to give players an extra (optional) challenge as they leveled up. Raids don’t have to require 50 players; they could easily be worked into Diablo 3 without changing the overall game function. They’d just be special dungeons that were tweaked to be much more difficult than other dungeons of that level. Flagship Studios attempted something like this with their (now-aborted) title Mythos. All dungeons could be played solo or in a group, but some were “epic” and were recommended for parties.These epic dungeons could be done solo, but clearing them out by yourself took forever. The implementation in Mythos wasn’t that great; the epic dungeons were just normal dungeons with about five times more monsters, and the endless clicking and weapon repairs/potion buying grew tedious. But the concept was interesting, and it definitely spiced up the level-up process. Another possible gametype in Diablo 3, party-only dungeons would be just that. They would actually require parties to enter. The concept is summed up in a post by Kavlor in our D3 Suggestions & Wish List forum. …for instance 2 pressure plates have to be stood on for a 3rd person to go through a gate and fetch a key. A deadly boss that depends on minions for invulnerability but the minions respawn and must be killed within a time limit before they pass on the invulnerability. Maybe players have to split up and do their part to get a machine going. Such areas would not necessarily be epic in difficulty; they’d just be party-only, giving players additional incentive to make friends and play together over Battle.net. The D3 Team has said they’re open to considering arena combat, guild support, special PvP games and ladders, and so forth, but none of these are yet confirmed. They’re also not the party-based, co-op game type I’m covering in this column. We’ll get to those game types in another installment of On the Drawing Board. Raids and bonus quests and party-only games are hard to hard to argue against, if we assume they’re just free cake. Bonuses added to the core game; things players can do online if they want to, but that aren’t required. This dynamic changes if there are special events that have special rewards. If there are items that can only be found on such quests, or even if the odds of scoring the top items (or huge experience) are higher on those events, then the competitive players on Battle.net will specialize in them, and players who can’t join such groups, for whatever reason, will object to the “unfair advantage” other players are gaining. Is this a valid concern? Many runewords and uniques are only findable on the realm ladders. The Pandemonium Event and Uber Diablo can be beaten far more easily by some classes/builds than others. Yet most players on Battle.net don’t object to them on those grounds. Just because one of your characters can’t do something doesn’t mean you think other players shouldn’t have the chance to engage in it. Does it? This discussion is largely speculative at this point, and will remain so until Blizzard reveals more about Diablo 3’s online play. Prior to Diablo 2’s release, the D2 Team was full of happy ideas about guild support, arena games, multiplayer bonuses, special difficulty levels that would only be playable by large parties, and so on. As we know, none of those features actually made it into the game, reinforcing the wisdom in not counting too many online chickens before their B.net eggs hatch. Whatever bonus party features (or not) we see in Diablo 3, it is clear that the game isn’t going to be designed like WoW, or other MMORPGs, where lots of the end game content requires huge parties. Diablo 3 will likely be more fun and more rewarding in groups, whether or not there are special game types. 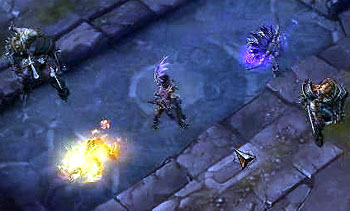 But Diablo 3 won’t require them, and D3 will not support massive party battles as seen in MMORPGs. Such huge games aren’t feasible with the game engine and isometric view, and they wouldn’t be fun with the “designed to succeed solo” play style of all the Diablo 3 characters. It’s amusing to imagine 15 melee characters “zerging” Mephisto, while mage characters fill the sky with elemental death, but it wouldn’t be very playable or rewarding in actuality. Other types of multiplayer games could be, which is why we’re looking for your opinions and input. QUESTION: Do you want to see more multiplayer game modes in Diablo 3? Should Blizzard pack special rewards that can not be obtained elsewhere in the game (such as the Annihilus and Hellfire Torch)?